We are working on it but we do not have a release date yet. Could be a couple of months or more but definitely before the end of the year We are unable to give any date because we do not compromise on quality in the need to meet some deadline. Developing qood questions with accurate explanations is hard and we give our authors as much time as they need. Taking OCP 8 and then OCP 11 will cost you twice the money. I think opening up of the OCP11 exam for OCA 8 cert holders is a great opportunity to acquire the latest cert at the cost of only one exam. So, if you can wait a couple of months for the study material, take OCP 11 then. In this post: https://coderanch.com/t/708409/certification/Java-certification-exam-relevant-OCA Jeanne Boyarsky recommends to stick to OCA/OCP8 for at least one more year until materials are available for the new exams. Paul Anilprem wrote: OCAJP/OCAPJP 8 will not be "old" for another couple of years at least. Java 8 exams already include some of the most important topics (streams and lambda) so I would not worry too much about it going obsolete anytime soon. It will still be as valuable as it was. Paul Anilprem wrote: I don't think the new exams (815 and 816) are any more tough that the older (808 and 809) exams but the absence of books and mock exams certainly make them look like so. This will not be a problem in a couple of months time. However, the bigger issue is the focus of the new exams. The new exams focus quite a bit on modularization. But modularization is not yet a clear winner in the industry, IMHO. So, I don't think you would be losing out much by not going for the new exams. Scott said the 815 is harder. Neither of has taken the 816 yet so can't comment on that though. I would strongly recommend people take the OCA/OCP 8. Probably for another year. Thank you Jeanne for the recommendation. I have OCA8 and didn't know which way to go for the OCP (809 or 816 exam). Now the answer is clear, OCP8, there is a lot of material on that one. That was my initial plan, is there something i'm missing ? You are right. I was not sure about whether one could take 816 after 808. But Oracle has confirmed it. You can directly go for 816 if you have cleared 808. No need to take 809. Any idea by when will Enthuware have mock exams for 1ZO-816 ready? I have OCA8 and I wanted to go for OCP8 this year. But reading Oracle's pdf, I realized that I only need to pass 1ZO-816 exam to get the OCP Java 11 certification. However I am worried that there is (and won't be by the end of the year) not enough preparation material for OCP11. My other option would be to go for OCP8 (because there are tons of materials on this topic including your nice mock-exams) and later (if ever) I should do the OCP11 upgrade. The new OCPJ11Dev (or whatever it's shortcut will be) has been released but it seems to have a different format than the Java 8 one. It doesn't have an OCA and an OCP anymore, it only has OCP with 2 exams needed to pass. I already have the OCAJ8P certification and I was planning to take the exam for OCPJ8P as soon as possible, and at a later date if I need to, do the upgrade to OCPJ11Dev. This way I will keep on having a new certification after each exam. Would it be reasonable for me to assume that OCPJ8P will not be retired this year? That would give me enough time to prepare and pass the exam. P.S. I know that only Oracle could give me a 100% answer, so I am just looking for best guess here. It's always good to see a general Java programming book. Although I've read a few, I have to admit I've never read the Core Java one. So I was wondering if the style of the book is more of a tutorial or a reference book?. I'm curious as to why you would categorize Groovy like that? I would consider Groovy to be a full, general-purpose language for the JVM -- just like Clojure, Kotlin, Scala, and several other languages that have appeared since Java. You are right, Groovy is much more than just a scripting language. I've just come to personally associating it to a scripting language because of the way I am using it in my daily work (Unit and Functional testing of ETL processes inside SoapUI). Why should you learn it? Simply because it will *probably* integrate with your existing projects, and it will give you access to features like co-routines and more advanced generics. 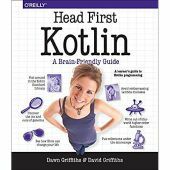 Would one regard Kotlin as a specific scripting/programming language, like Groovy for example or another full fledged general purpose programming language like Java or C/C++? What would be the drive for one to learn this new language, and more importantly how to convince your boss that it's worth investing in a training program for the entire development team. Welcome Dawn & David Griffiths. Looking forward for another nice Head First book. It's good to see the book keeping up with the language changes. Java in a Nutshell was always a good reference for me. I currently own the 6th edition but I've used older ones as well. Does the book contain enough new information so that an upgrade from 6th to 7th version is warranted? 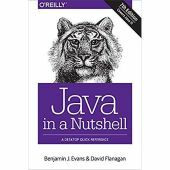 I realize that it covers Java 11, but besides that, has anything drastically changed in the book format? If _______________, you have at least another level to master before calling yourself a programmer. I mean this: I once had a colleague who did everything in Delphi what could have be done far more easily in e.g. a shell script. But he knew Delphi, so everything was solved with calling a little Delphi exe. Calling a Delphi console exe to copy some files to a certain location, stuff like that. This is exactly the one I wanted to write as well Now I have to thing of another one. This way you can see what sources everyone else used: books, software, mock-up exams, etc. why do people use IDE ? Even though I had experience with Java and IDE's, when I took my OCAJP exam, I went back to classical editors (VSCode without any java plugin enabled), command line and javac/java commands. This was an invaluable help in understanding some of the things an IDE is usually hides from me (like classpaths and package dependencies). However, I was still using an IDE for the purpose of studding the JDK itself. I've looked at a lot of code from common java classes (like LocalDateTime for example). This helped a lot in understanding how the actual JDK works. To be honest I've enjoyed studying the design of the classes itself. See all the method implementations, the different constructors... etc. Sure, I could have looked all this information up on the official JDK documentation page online, but it felt more natural and easy doing it in an IDE. just my 2 cents on the subject. Thank you for the tips, I will try them.